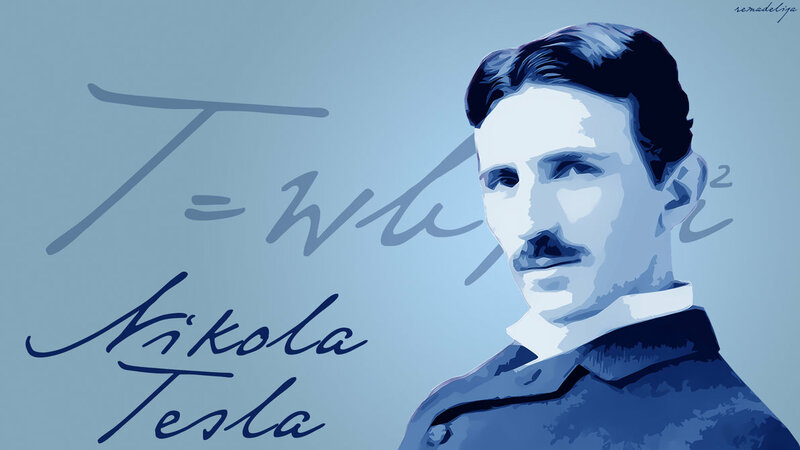 While most people –especially young generations—are unaware of this, Nikola Tesla is one of the greatest scientific minds and inventors the world has ever known. Even though he is entirely absent from out history books, he is a man that created the foundation for today’s technology and lifestyle. But in addition to all of his inventions, Nikola Tesla was among the first people on Earth who claimed to have intercepted alien messages from outer space. Everything from radio to remote controlled vehicles, Nikola Tesla laid down the necessary foundation for NASA and many other scientific agencies around the world, not to mention that he wanted to give the world unlimited free energy a hundred years ago. Nikola Tesla is the man who harnessed lightning; he was a true genius, and he envisioned new technologies far before their time and even claimed to have had contact with extraterrestrial beings. At the age of 28, Nikola Tesla moved to the United States and started working for Thomas Edison. Edison and Tesla became quickly rivals with different ideas; Edison was experimenting with direct current and Tesla with alternating current, competing to win the right to harness Niagara Falls and whoever controlled Niagara Falls practically controlled the power to the entire Northeast. Tesla’s inventions went far beyond electricity. He made groundbreaking discoveries such as wireless radio communications, turbine engines, helicopters(although it was Da Vinci who first had the idea), fluorescent and neon lights, torpedoes and the X-ray among others. By the time of his death, Tesla held nearly 700 worldwide patents. But in addition to all of the above, Tesla firmly believed we were not ALONE in the UNIVERSE. I think that nothing can be more important than interplanetary communication. It will certainly come some day, and the certitude that there are other human beings in the universe, working, suffering, struggling, like ourselves, will produce a magic effect on mankind and will form the foundation of a universal brotherhood that will last as long as humanity itself. Tesla seemed extremely convinced about alien life elsewhere in the cosmos. In fact, not many people are aware of the fact that in 1900, while he was working at his famous Colorado Springs Laboratory, Nikola Tesla ANNOUNCED that the intercepted EXTRATERRESTRIAL radio signals. Despite the fact that the scientific community then thought Tesla was crazy, radio signals were something that was an unfamiliar concept to anyone but Tesla, leading to the obvious conclusion that Tesla was greatly misunderstood in his time. Perhaps one of the most noteworthy subjects we need to mention when talking about Tesla and ‘Aliens’ is the infamous Black Knight Satellite which wasn’t confirmed and tracked by researchers around the globe until 1932. Interestingly, Tesla believes he had spotted it in 1899 while working in his Colorado Springs laboratory, he started hearing mysterious rhythmic sounds on his radio receiver. The changes I noted were taking place periodically, and with such a clear suggestion of number and order that they were not traceable to any cause then known to me. I was familiar, of course, with such electrical disturbances as are produced by the sun, Aurora Borealis and earth currents, and I was as sure as I could be of any fact that these variations were due to none of these causes. The nature of my experiments precluded the possibility of the changes being produced by atmospheric disturbances, as has been rashly asserted by some. It was some time afterward when the thought flashed upon my mind that the disturbances I had observed might be due to an intelligent control. Although I could not decipher their meaning, it was impossible for me to think of them as having been entirely accidental. The feeling is constantly growing on me that I had been the first to hear the greeting of one planet to another. . . . I was not merely beholding a vision, but had caught sight of a great and profound truth. –Talking with planets by Nikola Tesla. Others may scoff at this suggestion…[of] communicat[ing] with one of our heavenly neighbors, as Mars…or treat it as a practical joke, but I have been in deep earnest about it every since I made my first observations in Colorado Springs… At the time, there existed no wireless plant other than mine that could produce a disturbance perceptible in a radius of more than a few miles. Furthermore, the conditions under which I operated were ideal, and I was well trained for the work. The character of the disturbances recorded precluded the possibility of their being of terrestrial origin, and I also eliminated the influence of the sun, moon, and Venus. As I then announced, the signals consisted in a regular repetition of numbers, and subsequent study convinced me that they must have emanated from Mars, the planet having just then been close to the earth. –Wizard: The Life and Times of Nikola Tesla : Biography of a Genius. In fact, according to the American Physical Society Physics, Nikola Tesla had concluded that the mysterious signals, or the strange unnatural object the signals were originating from, was extraterrestrials, or at least their effort to communicate with Earth. In conclusion, we understand that Nikola Tesla stated on multiple occasions that he thought he intercepted signals from intelligent beings from outer space. Tesla indicated that even the most primitive or simple form of communications –like the eventual exchange of numbers— could, in fact, be an intelligible radio transmission originating from advanced extraterrestrial beings. Was Ezekiel In Contact With Extraterrestrials In The Bible?